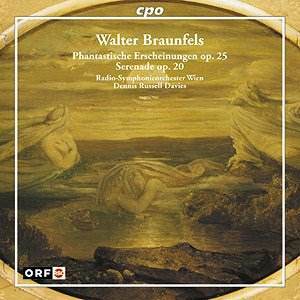 You might know Braunfels� name: his opera Die Vögel was included in Decca�s outstanding Entartetemusik series. In fact it was Braunfels� opera that made his name, if briefly, during the first half of the last century. The operas are: Ulenspiegel (1913); Die Vögel (1920); Don Gil von den Grünen Hosen (1924); Der Gläserne berg (1929); Galathea (1929); Der Traum ein Leben (1937); Szenen aus der Leben der Heiligen Johanna (1943); Verkündigung - Ein Mysterium (1945) and Der Zauberlehrling (1954). His oratorios are also reportedly well worth revival: Offenbarung Johannis (1919) and Spiel von der Auferstehung (1954). The Phantastiche Erscheinungen eines Themas von Hector Berlioz (or Fantastic Appearances of a Theme by Berlioz) was premiered in Zurich in 1920. The Berlioz theme is from the Song of the Flea from The Damnation of Faust. The music is a grand, even overblown, orchestral fantasy. The opulent indulgence sits somewhere between Strauss�s Ein Heldenleben, and Don Quixote, Bruckner and Schumann. The shade of late Beethoven also passes wistfully through these pages - especially the Choral Symphony and, from earlier, Egmont. From time to time the music takes on an Elgarian nobility especially in the first two movements and the finale. The latter grasps nobility with conviction - somehow bridging the gap between Strauss�s Don Juan and Elgar�s Falstaff. Quite why it was necessary to omit the ninth Erscheinung I do not know - even if it was a customary elision when the work was first being performed. The twelfth Erscheinung quotes the melody Für�s Vaterland zu sterben (To Die for the Fatherland) reminding us that the work was written during the Great War. It also reminds us that largely unexplored is the effect of the Great War on German music of then contemporary composers. It is a bit of an unnerving confection, with the jocular jostling with the apocalyptic. Not fully successful but an interesting listen nonetheless. The four movement Serenade steers well clear of anything in the way of rodomontade. It is a sunny and very successful work reflecting the happiness of the composer�s recent marriage. It achieves a remarkably centred stillness in the Ruhig third movement. Braunfels was happy working gently within the mood and expressive confines of a style we now associate with Elgar�s shorter orchestral works, and those of Goldmark, Huber and Massenet. Beethoven�s Pastoral Symphony might also have been somewhere at the back of the composer�s mind too. Braunfels was a German composer, born in Frankfurt-am-Main, who studied in his birthplace, with Leschetizky in Vienna and with Thuille in Munich. He found his metier as director of the Cologne Academy of Music with Hermann Abendroth. This lasted from 1925 to 1933 when political issues swept him out. He returned to that position in 1945 and retained it until his retirement in 1950. These two rather backward-looking works are enthusiastically performed and will provide romantic rewards for the curious.